Joe Sacco is my favourite graphic-novel journalist. 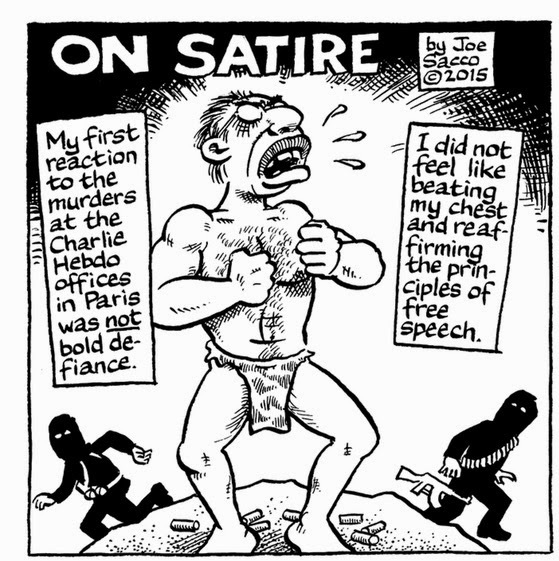 All of us deplore the attack on Charlie Hebdo, but his response is the most thoughtful analysis I've seen. Joe shows his inability to make thoughtful distinction. It is part of the ideology neither of "black people" nor of Jewish people to make threats of violence or death when they are offended by a cartoon or the written word. On the other hand a substantial number of muslims do want violent retribution for offence to their ideology. Moderate muslims should be more offended by that than some cartoons. I don't find his argumentation convincing. Racism or antisemitism is discriminating people for what they are, for their birth. When someone is from a given ethnic group or from a family with a given religious tradition, there is nothing they can do about it. On the other hand, a religion is an ideology, one is (well: should be) free to be a member of a religion or not, to change religion whenever they want, etc. Therefore a religion ought to be criticized, debated, made fun of, like any other ideology or concept, such as, for instance, socialism, space travel or economic liberalism. Over the years, the main targets of Charlie Hebdo have been catholicism and right-wing parties. Islam has made a few appearances in the recent years, and for me it's nothing else than an acknowledgement that Islam has become one of the mainstream religions in Europe. It's not about "each other's world". There is only one world, and the personal choices of every citizen in this world can be debated. The Islamists try to attract people in this trap: as if it were "our" world against "theirs". That's why I don't agree with Sacco's analysis. Sorry, Tom E, I'm going to call you on racism here. 'It is part of the ideology neither of "black people" nor of Jewish people to make threats of violence or death when they are offended by a cartoon or the written word.' It's not part of the ideology of the Muslim religion either. 'On the other hand a substantial number of muslims do want violent retribution for offence to their ideology.' Not Muslims, Muslim extremists, a tiny minority of Muslims (many Muslims would say the extremists are not true Muslims at all). And surely you are aware there are also Christian and Jewish extremists who want 'violent retribution for offence to their ideology'. If use what happened in Paris to make Muslims unwelcome in western society then you are behaving exactly as the extremists hoped. C, I think you miss Sacco's point. No one is arguing against criticism of religion. I am with Salman Rushdie, and I'm sure Sacco is too: "Religions, like all other ideas, deserve criticism, satire, and, yes, our fearless disrespect." But the attacks against blacks and Jews that Sacco referenced were not part of a discussion about ideology, they were racism. And so are some of the attacks against Muslims today. Drawing a line between acceptable criticism of religion and unacceptable racism is not easy. And that is Sacco's point: we have hard work ahead to create a world fit for all of us. No Phil, actually I'm not. Perhaps you could provide some evidence, along with some means of quantifying that tendency to violent retribution is as endemic to the Christian and Jewish world as it is to the Islamic. I'll mention two, and let you look up others for yourself. For Christians, the Crusades. For Jews, there have been many fatal attacks by settlers on Palestinians (not to mention Israeli attacks on Gaza, but I won't claim that is solely about religion). Wow, the Crusades that happened 700 years ago and can barely be described as arising from "violent retribution for offence to ideology", and attacks by settlers that certainly are nothing to do with offence to ideology. Compare that with the violent outrage expressed frequently across the Islamic world at perceived insult. I think you've made my point for me Phil. If you want something less medieval, think of Christians bombing abortion centres. If you are not wearing blinders, I think you'll be aware that extremists of all religions engage in violent acts motivated by their religion. I would like to point out that so far since those events no muslim has been killed or hurted in France. On the other hand many native french have been murdered or wounded to varying degrees. There are the ones in the headlines you know about, as those journalists, but also a lot of everyday civilians, whose sole guilt is to be too old and weak, too poor to have moved away from the danger, too few in front of many, too jewish, too catholic, or just randomly unlucky. Finding a way to tame that situation has been a long time but very elusive goal, despite the huge and long standing efforts directed toward it, as well as the constant precautionary security measures on french part. Now what can possibly go wrong when a group of people who not so far ago left millions on battlefields get attacked on their own soil, by people openly defying them ? Should it continue to unfold in the very predictable direction it has taken so far, the expeditions to liberate Jerusalem might seem very tame in retrospect. But there is worse, to truely appreciate the scale of the danger. See that problem with a bigger worldwide view where weaker nations are falling to the same adversary around the globe, in very different contexts. Add it a long time perspective where a multi-secular enemy engulfed, and sometimes succesfully destroyed, part of europe forever. I would like to point that to date, we still have yet to count a single muslim victim in france. In that period, there have been countless murders of indigenous french people and attempts to kill them, in the name of islam. Despite the very moderate and light touch way to handle that issue, prevent confrontation, with large 360deg state effort, a solution remains as elusive as ever.